When this research was performed both authors were with the Department of Physics, Texas A&M University, College Station, Texas 77843-4242. R. M. Pope is now with the U.S. Army, Fort Belvoir, Virginia 22060-5823. E. S. Fry is also with the Texas Laser Laboratory, Houston Advanced Research Center, The Woodlands, Texas 77381. Definitive data on the absorption spectrum of pure water from 380 to 700 nm have been obtained with an integrating cavity technique. The results are in good agreement with those recently obtained by our group with a completely independent photothermal technique. As before, we find that the absorption in the blue is significantly lower than had previously been generally believed and that the absorption minimum is at a significantly shorter wavelength, i.e., 0.0044 ± 0.0006 m−1 at 418 nm. Several spectroscopic features have been identified in the visible spectrum to our knowledge for the first time. M. R. Querry, D. M. Wieliczka, D. J. Segelstein, “Water (H2O),” in Handbook of Optical Constants of Solids II, E. D. Palik, ed., (Academic, San Diego, Calif., 1991), pp. 1059–1077. H Buiteveld, J. H. M. Hakvoort, M Donze, “The optical properties of pure water,” in Ocean Optics XII, J. S. Jaffe, ed., Proc. SPIE2258, 174–183 (1994). F. M. Sogandares, E. S. Fry, “Absorption spectrum (340–640 nm) of pure water. I. photothermal measurements,” Appl. Opt. 36, 8699–8709 (1997). 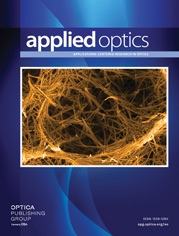 A. C. Tam, C. K. N. Patel, “Optical absorptions of light and heavy water by laser optoacoustic spectroscopy,” Appl. Opt. 18, 3348–3358 (1979). E. S. Fry, G. W. Kattawar, R. M. Pope, “Integrating cavity absorption meter,” Appl. Opt. 31, 2055–2065 (1992). R. C. Smith, K. S. Baker, “Optical properties of the clearest natural waters (200–800 nm),” Appl. Opt. 20, 177–184 (1981). F. M. Sogandares, “The spectral absorption of pure water,” Ph.D. dissertation (Texas AM University, College Station, Tex., 1991). R. M. Pope, “Optical absorption of pure water and sea water using the integrating cavity absorption meter,” Ph.D. dissertation (Texas AM University, College Station, Tex., 1993). Xenon Arc-Lamp Model 66005 (Oriel Corporation, Stratford, Conn.). Monochromator, Digikrom Model 240 (CVI Laser Corporation, Albuquerque, N.M.). Electromagnetic Camera Shutter (Copal Model DC495, R.T.S., Inc., Deer Park, N.Y.). High diffuse reflectance material, Spectralon SRM-99 (Labsphere, Inc., North Sutton, N.H.). See Section IX of Ref. 5. P. R. Bevington, D. K. Robinson, Data Reduction and Error Analysis for the Physical Sciences, 2nd ed. (McGraw-Hill, New York, 1969). The liquid absorption standards are identified by NBS#931d, Lot#680312, and were obtained from the NIST Office of Standard Reference Materials. A software program for the MacIntosh, profit (QuantumSoft, Cherwell Scientific, Oxford, 1996). “Ultrapure ion free/organic free water for trace analysis,” Lit. No. CG302 (Millipore Corporation Bedford, Mass., 1986). Note that although exactly the same raw data were used, the values quoted here are different from those in Pope’s dissertation,8 which contains a systematic error that is due to a dependence of one calibration constant on the water absorption coefficient (his Fig. V-8). The thorough analysis leading to our Eqs. (18) and (19) avoids this problem; also, we have used rigorous statistically averaging techniques to extract the maximum information from the raw data. W. S. Pegau, J. R. V. Zaneveld, “Temperature-dependent absorption of water in the red and near-infrared portions of the spectrum,” Limnol. Oceanogr. 38, 188–192 (1993). N. K. Højerslev, I. Trabjerg, “A new perspective for remote measurements of plankton pigments and water quality,” (Københavns Universitet Geofysisk Institut, Copenhagen, Denmark, 1990). L. P. Boivin, W. F. Davidson, R. S. Storey, D. Sinclair, E. D. Earle, “Determination of the attenuation coefficients of visible and ultraviolet radiation in heavy water,” Appl. Opt. 25, 877–882 (1986). J. G. Bayly, V. B. Kartha, W. H. Stevens, “The absorption spectra of liquid phase H2O, HDO, and D2O from 0.7 μm to 10 μm,” Infrared Phys. 3, 211–223 (1963). Fig. 1 Block diagram of the ICAM system. Fig. 2 Cross sections of the integrating cavity (a) perpendicular to the Y axis at the location indicated in (b) and (b) perpendicular to the Z axis at the location indicated in (a). Fig. 3 Examples of the signal S as a function of the volume V (liters) at six wavelengths. Also shown are the two straight-line fits to the data, the value of their slope, the two y intercepts, and the standard deviations. Fig. 4 (a) Pictorial simulation of the S versus V data showing the definitions of the y intercepts (c01, c02) and of the signal shifts (s0, s1, s2). The latter are all positive for shifts in the direction shown. (b) Pictorial representation for the linear dependence of a signal shift si on δSi and δVi, where i = 0, 1, or 2. Fig. 5 Offset s0 as a function of λ (nanometers). The solid curve is a least-squares fit to the data points; the slight irregularities are due to statistical fluctuations in the ∂S/∂V data. Fig. 6 Net offset s as a function of λ (nanometers). The solid curve is a weighted least-squares fit to the data points; the slight irregularities are due to statistical fluctuations in the ∂S/∂V data. Fig. 7 Examples of the value of the absorption a ≡ adye as a function of the observed signal S ≡ Sdye at six wavelengths. Also shown is a straight-line fit to the data together with the corresponding value of the slope and its standard deviation. Fig. 8 Observed slopes as a function of wavelength. The solid curve is a least-squares fit to the data by a sum of five Gaussians. Fig. 9 Wavelength dependence of the two calibration constants. Fig. 10 Present results (●) for the absorption of pure water plotted with those from Buiteveld et al.2 (smooth curve), Tam and Patel4 (△), Smith and Baker6 (○), and Sogandares and Fry3 (□). Fig. 11 Comparison of our final results given in Table 3 (●) with those obtained from Eq. (34) (○). Fig. 12 Present results for the absorption of pure water. A large arrow with a boldface integer n indicates the predicted position of a shoulder that is due to the nth harmonic of the O–H stretch; the small arrows with mode assignments (j, 1) indicate the predicted position of a combination of the jth harmonic of the O–H stretch with the fundamental of the scissors mode.